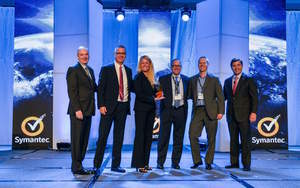 DENVER, CO--(Marketwired - Dec 8, 2015) - InteliSecure, the leading managed security service provider (MSSP) delivering critical asset protection for enterprise organizations globally, today announced it has been recognized by Symantec Corporation as its North American Managed Innovation Partner of the Year. The honor was bestowed at Symantec's 2015 Partner Engage conference held in October, where each year Symantec recognizes its most innovative and experienced industry partners. "The Symantec partner awards are an opportunity to recognize the great work our partners are doing and the positive impact they're making with customers, the community and Symantec," said Stephen Thomas, vice president, Americas channel sales for Symantec. "Our channel partners are critical to our business. Each year, we recognize partners who demonstrate innovation, growth and commitment to our joint customers. I'd like to congratulate this year's winners as we continue to advance security together." InteliSecure CEO and co-founder Rob Eggebrecht: "We thank Symantec for this honor that once again shines the spotlight on InteliSecure's reputation and track record for remarkable managed security services innovation. InteliSecure is leading the way as decision-makers heed the call to lock down and protect their most sensitive mission-critical data, communications and intellectual property, as industrial espionage and the assault on enterprise assets continues to escalate in frequency, complexity and scale." InteliSecure is raising eyebrows and filling a critical void as traditional cybersecurity point products and automated tools continue to miss the mark. The daily theft and compromise of highly sensitive intellectual property, including customer and patient records, M&A correspondence, blueprints, formulae and other mission-critical assets, can have a devastating impact on the enterprise; from damage to business unit operations and financial instability, to shaken customer and investor confidence and corporate reputation. The company recently acquired UK-based Pentura following successful completion of a Series B equity investment round led by Charlotte, NC-based Frontier Capital. In October, the Denver Business Journal named InteliSecure the region's second fastest growing company among organizations earning between $8M and $24M annually. Headquartered in the booming Denver Tech Center, InteliSecure protects more than 500 enterprise customers and three million users globally with managed security services tailored to safeguard enterprise assets from the escalating frequency and scale of global cybersecurity threats. InteliSecure challenges the status quo with unmatched human intelligence protection through its acclaimed Critical Asset Protection Program™ methodology, comprised of robust managed consulting, technical, incident response and security assessment services. By identifying and prioritizing critical assets such as intellectual property, InteliSecure delivers the continuous security monitoring intelligence required to protect organizations from internal or external compromise. InteliSecure is one of North America's fastest growing companies, ranking on the Inc. 5000 in 2015 and 2014, #2 on the Denver Business Journal's fastest growing companies, and is the recipient of numerous industry awards and accolades. InteliSecure supports leading security solutions from Symantec, McAfee, IBM® Security QRadar®, Websense, Proofpoint, Blue Coat, LogRhythm, Titus and Qualys, among others. To learn more visit www.intelisecure.com. Source: Symantec. L-R: John Thompson, VP Global Partner Sales, Alliances and Strategy, Symantec; John Sorenson, VP of Sales Americas, Symantec; Hillary Laird, SVP Marketing and Strategic Alliances, InteliSecure; Tim Shanahan, VP Sales, InteliSecure; Mike Koster, Manager Strategic Partnerships, InteliSecure, and Stephen Thomas, Vice President, Americas Channel Sales, Symantec.